When you listen to this single and you know Máire Brennan's sister Enya's body of work, it's hard to imagine that there was ever a rowdy party at the Brennan residence. The music of the two sisters is beautiful, but sometimes verging on boring. 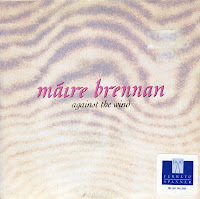 This second single from Máire Brennan's debut solo album 'Máire' flopped in the UK. The B-side, sung in Gaelic, would not be out of place in a church repertoire. Sometimes you would just wish that Máire would rock out a little. Máire Brennan was born as Máire Philomena Ní Bhraonáin on August 4, 1952 in Gweedore, Ireland. In 1970 joined her two brothers Pól and Ciarán and their mother's two twin brothers Noel and Pádraig Ó Dúgáin to form Clannad. With this Irish band they enjoyed a lot of success - and, in the Eighties, even international success - and recorded 17 albums. In 1992, Máire decided to go solo. 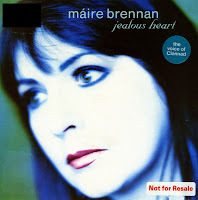 She released her debut solo album 'Máire', from which her debut single 'Against the wind' was taken. It was the only single by her to reach the UK singles chart, although it only peaked at number 64.